Imam Santoso was delivering the tips to get the scholarship abroad in Postgraduate Hall UNS, Tuesday (4/5/2016). International Office Universitas Sebelas Maret (IO UNS) cooperates with ALFALINK held the scholarship socialization in Postgraduate Hall UNS, Tuesday (4/5/2016). 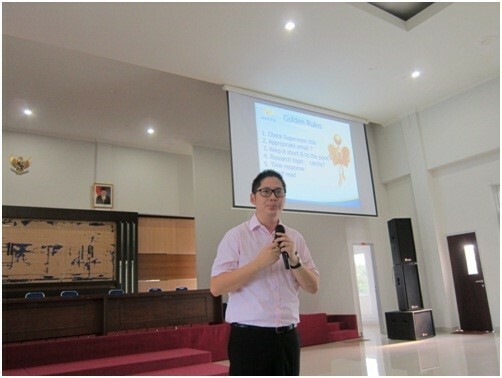 The event presented Imam Santoso as the speaker. Imam Santoso was the awardee of ADS (Australian Development Scholarship), which is now known as AAS (Australian Awards Scholarship). The socialization aimed to socialize about scholarship information for the college students who intend to get higher education abroad. In the socialization, Imam Santoso enlightened the audience about the various kinds of scholarships based on their degrees such as LPDP and DIKTI. He explained the steps that should be taken for applying the scholarships. “The most important things to do are putting the field of study first, then you may choose the university, and finally complete the requirements needed.” Imam explained. Imam also gave the tips when studying overseas such as how to get part time job, adjust with the weather, and adapt with new environment. Besides arranging the administration documents, the students also have to actively pay attention on the unexpected things that might happen including the high living cost and cultural differences. I am a Namibian citizen who wants to study towards a master in management with speciallisation in Human Resource Management. I would like you to send me the application form for admission and all the information. I cant find it on the University’s website.